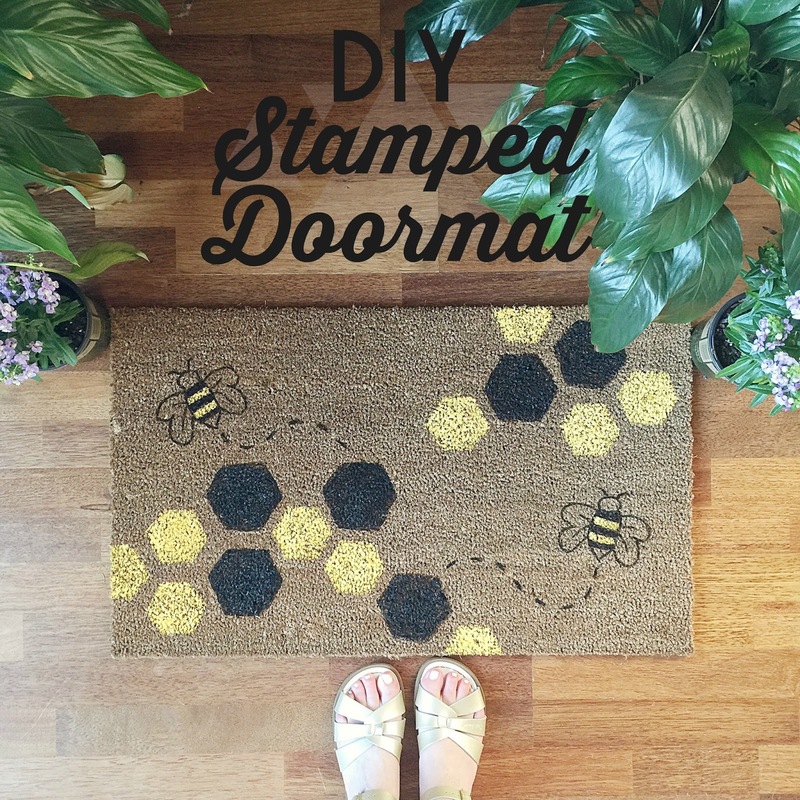 I saw the cutest doormat EVER on Pinterest the other day and I just had to try to recreate it. Well, not only did I recreate the adorable watermelon motif but I also made my own version with bees that is the perfect Mother's Day gift for my Mother-in-law who just happens to raise honey bees. The first (and hardest) part of this process was finding blank welcome mats. I thought this would be easy but the only place I could find them was at Home Depot. Everywhere else I looked had welcome mats that all had patterns, colors, or sayings. I also picked up a large sponge in the tile laying section (believe it or not, they only had little ones in the cleaning section.. go figure!) and paint. I got sample sizes of black and yellow for the bee mat and a pretty coral and green for the watermelons. For the watermelon mat, I followed the directions from the original source and cut my sponge up into stamps. After drawing the shape out with a sharpie (as you can see in the pictures) and doing a little bit of experimental cutting, I eventually got a watermelon slice in a good size. I then just went to town stamping the mat. When I was finished, I went back over the watermelon with a small paint brush to really get a good layer of paint on there and make the color brighter and more defined. When the pink was dry I drew the seeds on with a little black paint and a small paint brush. It turned out so cute!! I was feeling pretty confident after making the watermelon mat that I figured I could pull off a honey bee mat as well. I didn't have too much sponge left after the watermelons but I was able to get two different sized hexagons out of my remaining pieces. I also doodled a bee outline on a piece of paper that I stuck to the mat with some pins and then traced with a black paint pen. When I was done tracing the bee I went over it with the black paint and a thin paint brush. Then, just like the watermelon pieces, I simply stamped the hexagons onto the mat and then went over them with a paint brush to define the shape and brighten the color. That's it!! It didn't take very long and I gotta say, I think they both turned out super cute. I intended these both to be gifts but it will definitely be hard to let these go. I might just have to make one (or more) for myself. Maybe one with cactus?? Or donuts??? The possibilities are endless!! Super cute!! Love the bees! Well this is a super cute idea. Most definitely adding this to my list of DIYs!! So inspiring! Between the lemon pie recipe and the stamped rug, I believe I'll stamp a zestie rug for my front door!